Dennis has been known to wear driving gloves, crocodile leather boots, and vintage Star Wars tees. His superhero-like stealth allows him to dart around the bakery between the hours of midnight and nine am, organizing and packing bread products. 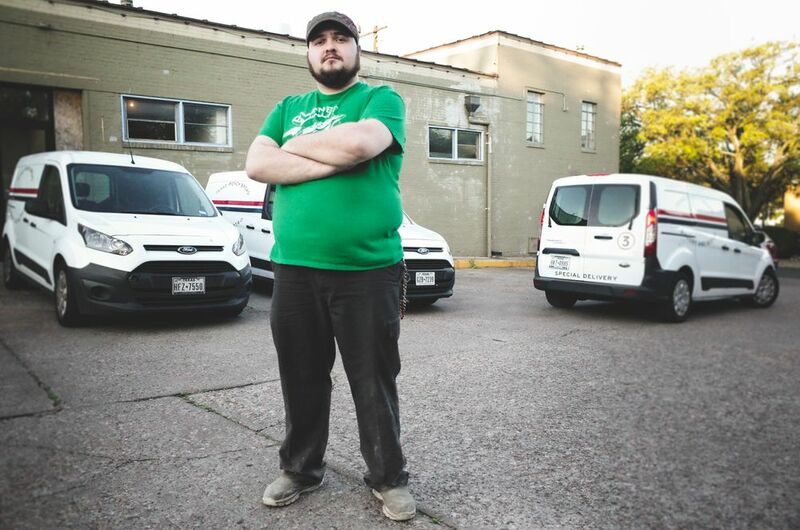 In the very early hours of the morning, with recognizable style and sharp wits in tow, he and his crew deliver our baked goods all over town, undaunted by the looming threat of morning commuters and highway traffic. But let's step back a few steps. Dennis's mother immigrated from Mexico. She eventually found herself in Utah, running a food truck situated outside a power plant. Dennis's dad diligently packed his lunch because buying prepared food was too wasteful in his eyes. But one day, Dennis's dad forgot his lunch and went outside to stand in the long line of engineers seeking an afternoon meal from Dennis's mom. Her first thoughts: he's one of the engineers that never eats my food - he's getting the cold shoulder. His first thoughts: I better start leaving my lunch at home more often. Eventually this part of the story leads to Dennis Day being born in Harlingen, TX. Dennis came to Texas French Bread after a series of employment mishaps. When he graduated from film school in Phoenix, he was slated to run the camera crew at a Harlingen news outlet. But despite promising him the position, the firm was in the process of automating the camera functions and the job fell through. Jeez - talk about the American story. Stuck with no job in Harlingen and a bunch of student loan debt, Dennis rolled up his sleeves and got to work. A friend had taken a job selling vacuum cleaners door to door in Austin, and suggested Dennis travel up to join him. To earn a position (and get paid) you had to do 60 vacuum demos in the first month - that means knocking on doors and talking someone you've never met into letting you in their house to demonstrate the working features of a vacuum cleaner. Rather astoundingly - Dennis managed 64 demos (and sold 12 units - are you kidding me???) in 30 days. The company promptly disallowed 5 of his demos lowering his total to 59 and causing him to miss the cut. So he quit. And in 2012 he answered a Craigslist post for a position washing dishes at some place he'd never heard of called Texas French Bread. We asked when he could start and he said "now" - always the best answer. For the next 8 or 9 months, he showed up on time and did the lowliest job in restaurant world - scraping food off other people's plates and running them through a large, loud, wet machine for 8 to 10 hours at a stretch. I'll spare you the rest of the story, but today, four years later, our Fleet Commander manages an overnight staff and oversees wholesale delivery. He applies the same dedicated, responsible and detailed focus to his work that I suspect he did when he decided to tackle 60+ vacuum demos in a month. He has earned a spot as a key member of staff at Texas French Bread. Be sure and say hello if you see him. Just look out for one of our TFB fleet vehicles and a pair of driving gloves.